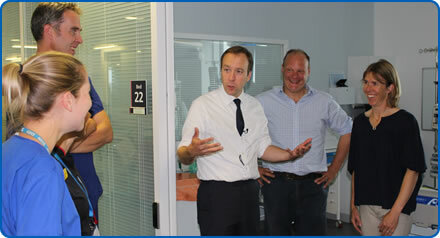 New Health and Social Care Secretary Matt Hancock paid an official visit to Southmead Hospital today. The Secretary of State returned to the hospital with his sister to thank staff for the care they gave her when she was treated here last year. 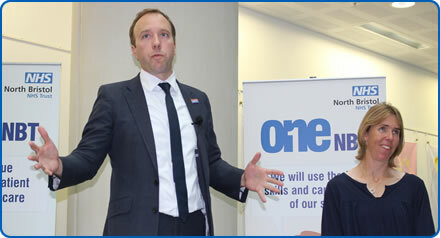 He also gave a speech to staff in the atrium of the Brunel building as he launched an engagement exercise to encourage staff to be part of a national conversation on health and care. 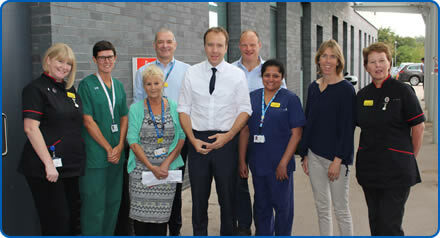 He found out about the care patients receive when they attend the regional Major Trauma Centre at the hospital, starting with a visit to the Emergency Department and meeting some long-serving members of staff. The Secretary of State then sat down with members of the team who cared for his sister during her time in the ICU. He rounded his visit off with a speech to staff about his plans to ask for their views on five key areas using a digital platform that will enable staff to share their views and comments. The Secretary of State completed his speech by telling staff he will be “eternally grateful” for the care hospital staff gave his sister. He then took questions from the staff who had gathered to hear him speak. “Nobody knows what needs improving more than hard-working staff themselves, so my message is clear: we are listening to you, we want your views, and we will use them to ensure the long-term plan for the NHS helps you,” the Secretary of State said.